An ode to a bus route? Well, yeah, kinda. 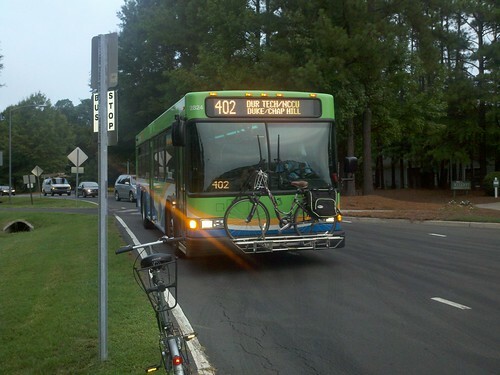 The Triangle Transit 402 and 403 are going away after Friday. The routes will still exist, served by the 800-series routes, and I shouldn't see an appreciable change in my level of service. But the 402 and 403 will be gone. Why does this matter? You see, the 402 and 403 have been my routes to varying extents for the last nine years. But, more importantly, it was a then-TTA 403 bus that I saw one Spring night in 2001 on my drive home. It had a bike rack on the front and the RideTTA.org web address on the back. I looked them up when I got home and thought, "I can do that." Since that night, my nine years of bike/bus commuting and four years involvement advocating for local bicycle and pedestrian (and transit) issues have largely been the result of my positive transit experience on the 402 and 403. These days I bike more than bus. But the bus remains an integral part of my car-lite existence. When I am injured, tired, facing rain or just don't feel like riding my bike, the bus provides me a car-free alternative for getting to work or around town. None of that will change, of course. The only thing that'll be different next week will be the number on the marquee. But I'll still miss the 4-0's. why Durham? Because Durham has DALE MCKEEL!! !